With the temperatures here flirting dangerously close to the triple digits and humidity that you can cut with a knife, I love being able to use my slow cooker to get a home-cooked meal on the table without having to heat up the kitchen too much. This Slow Cooker Chicken and Gravy is just that. 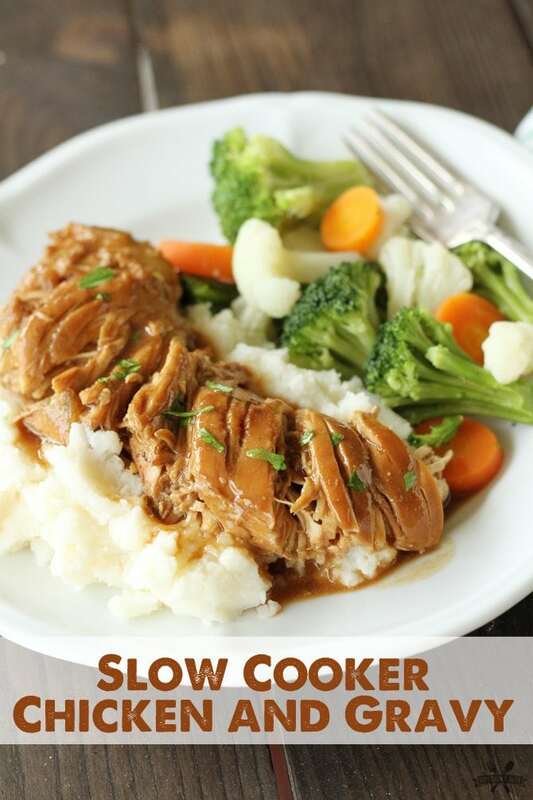 It’s a slow cooker adaptation of my Mom’s Chicken and Gravy and only calls for 4 ingredients! I used boneless, skinless chicken breasts – because that’s what I had on hand – but you can use any chicken pieces you wish. 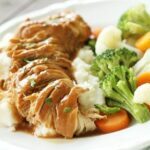 Serve this tender chicken and rich savory gravy with mashed potatoes or rice, add a simple veggie, and dinner is ready! And leftovers are fantastic when you shred them up and make a French Dip style sandwich! Y’all enjoy! Mix the onion soup mix, gravy mixes and water together in the crock of the slow cooker. Add the chicken, ensuring the chicken is covered with liquid, and cover. Cook on low for 3 to 4 hours. Find the gravy too thin? Simply mix 1 tablespoon of cornstarch with 2 tablespoons of cold broth or water in a small bowl. Stir the mixture it into the slow cooker. Cover and increase the heat to high for about 20 minutes or until the sauce has thickened. Goodness how can this one not be good! Love using my crock pot in the summer. The humidity here is thick too….I try to stay in the AC as much as possible. Thanks for another great recipe! 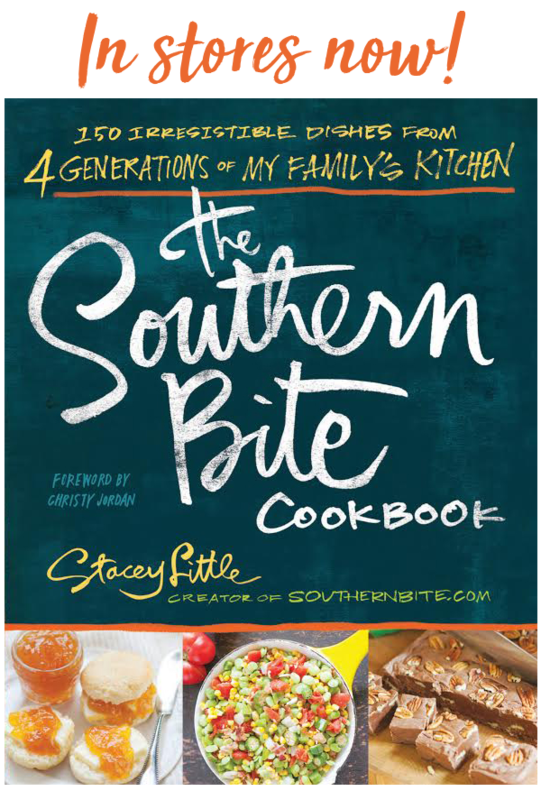 Well this was wonderful… I fixed it for lunch last week and my ‘gkids just loved it —hubby too. So one of my g’kids asked if she could have it for b’fast the next day…lol… I said no but you can have it again for lunch if you want…. she used a piece of bread to scrape her bowl !! I will make this again ! That’s fantastic, Adeline! I’m so happy to hear that everyone enjoyed it! Had this in the slow cooker all day yesterday. Took about ten minutes to prepare and the flavors were delicious. Just before dinner I made some fresh mashed potatoes to go with it. My wife loved it. The slow cooker is my new friend. I also steamed some frozen broccoli using a pot of boiling water, metal colander, and a lid from a larger pot/pan. Yes, mine too! 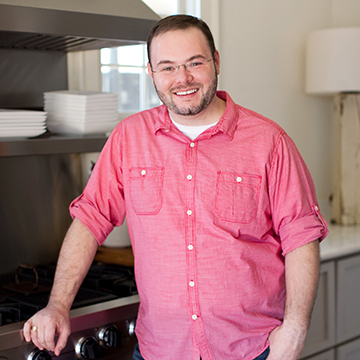 So glad you enjoyed the recipe, Joel! Hope it turned out great! Just made this for the family. I normally cook for groups of over 130 people and needed to try it out, so,who better than the family to use as guinea pigs? It was wonderful. 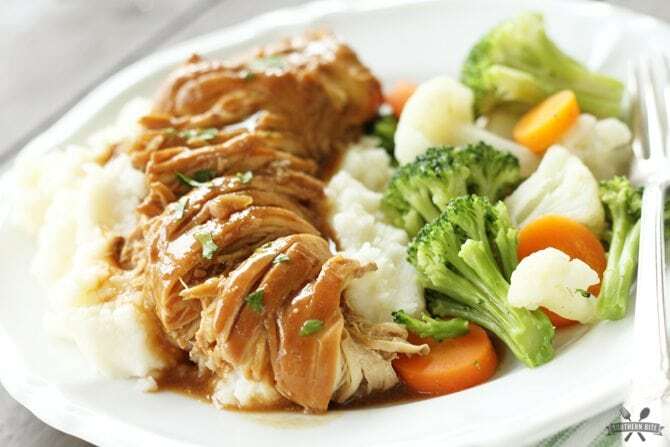 The gravy, though quite runny, kept the chicken moist and flavorful. The only thing I did different was I thickened the gravy with flour mixed in with a little bit of water and some of the cooked gravy, poured it back in to the crock pot for about an hour. Was wonderful! Would like to know how many servings you calculated for the recipe. About 4 or 5 depending on the serving size. Should I be using thawed chicken breasts??? Nearly all slow cooker manufacturers advise against using frozen meat in a slow cooker, so thawed would be best. I would love to try this recipe, but unfortunately my husband doesn’t like onions. Do you have any suggestions for substituting the dried onion soup mix? Is there another dried soup mix I could use? I’m actually making this right now. I substituted the onion mix with Ranch dip mix. Hopefully it works out. Please let me know if it does work as that would be perfect substitute. I’m just not sure. I’m afraid the onion soup mix is pretty important to the flavor profile. I have a trick that might help you out. I love onions but can’t really stomach them – they make me sick as a dog. I love onion soup mix though. What I do it take a sifter and sift out the onion flakes from the seasoning and that does the trick. You get all the flavor without the onions. Interesting, but a great tip if you don’t like the onion texture. I made this last night. I did add a little cornstarch/water mixture after removing the chicken from the gravy to thicken it a bit. Then I served the gravy over biscuits and the chicken. Got high praise from the hubby! Thanks for another great recipe, Stacey! Awesome! So glad to hear y’all enjoyed it! can you use leg quarters? if so, any changes to the recipe? Absolutely! Depending on the size of the quarters, you may have to extend the cooking time a little. Can I successfully use half water and half chicken broth for richer flavor? Maybe. But the delicious level is through the roof too! Do you have nutrition information for this? No. I don’t keep up with that information. There are a few great ones on the internet though. Made this today and it was scrumptious! And so very easy! This is definitely a keeper recipe that I will use again and again! Thank you! I LOVE hearing things like that, Le-Ann!!! I only have one packet of brown gravy mix..will it still work? It really depends on the size of the gravy packet. If nothing else, you’ll just have runny gravy. This would be awesome for beef chuck roast, too! YUM! Thanks! Awesome! I’m so glad y’all enjoyed it! Sorry, but after seven hours on low the chicken was done but it was still chicken au jus. -needed a quarter-cup of flour and 20 mins on the stove to turn it into gravy. Waiting now to see if it works for the family, but it sure does smell wonderful! Those gravy packets are often the culprit. Hope it turned out great after you made the adjustment! We substituted Ranch dressing mix for the onion soup mix and loved this! Served on toast made with low carb bread so my husband could have it. He said it was the best low carb dish he’s had. Will definitely make it again! I made this for the first time last night. Everyone loved it. The only complaint was that it was salty. Will make again with less gravy. Hi there. I don’t think this should be called a recipe. You’re basically just using someone else’s ( a giant corporation no less) by using packet mixes. What a waste of my time. @Louise don’t you have anything better to do at 2am than complain? Geesh get some sleep! This is a great “recipe” and not everyone thinks of doing something like this, especially new cooks. Stacey thanks for the great ideas & recipes, keep it up!! @Louise, this is a section for comments pertaining to the recipe, not a sounding board, if you don`t have anything to say about the recipe(s), just griping about them, than DON`T make them, but yes, it does have ingredients from (BIG named Corp) but doesn`t a lot of recipes? A recipe may say use flour, do you go out and grind up wheat, corn or rye or whatever to make your flour? NO, you buy it from a store that has their name brand plastered all over the packaging. If people don`t like the recipe(s) than don`t make them, but this recipe is helpful and can give others an idea on how to do this and helps give more suggestions on different ingredients. Thank you Stacey, for these quick recipe(s) and loved your response to negative individuals who haven`t ever tried these recipe(s). HI Stacy, do u think it would be ok to use 1 packet each of brown gravy and a chicken gravy packet? I’m short one brown gravy n chicken is all I have! Should I chance it? Or do U think maybe just use the 1 packet? Thanks! No, I think it will be just fine to use two different kinds. Could I make this with pork loin roast? I don’t see why not. 🙂 Enjoy! Forgive my naivety, but should I prepare the onion and gravy mixes according to the instructions prior to mixing? I’m reviewing tonight in preparation for tomorrow and don’t want to mess it up! No, you simply mix the dry packets with the ingredients listed in this recipe. Ignore the recipes on the packets. HSo I’m on a budget and I’m using ingredients I already have. I dont have onion soup but I have onion gravy mix and brown gravy mix as well would it still work out flavor wise?? Also could I throw some quarter cut potatoes in the crock pot with the chicken if so how long should i let the chicken cook before I add them. Trying to do some diffrent things with chicken so my Husband doesn’t get bored. We are doing really good cutting hamburger out of our dinners so far we had hamburger onve last week. I am doing this chicken, veggie, and rice personal diet to help him feel better working outside all day the hamburger was just making him feel so bad. All these awsome chicken recipies are sure to suprise my mother in law too. It sounds like it would work, but you’re creating a totally different recipe that I’ve not tested, so I can’t tell you exactly how it will turn out. Good luck! This was so simple and absolutely scrape the plate delicious!! All of my picky eaters ate it up and asked for more!! So glad everyone enjoyed it!! The recipe card is saying low for 3-4 hours but in the comments I’m reading low for 6-8 hours…which is it…? For the best texture, 3 to 4 hours is best.